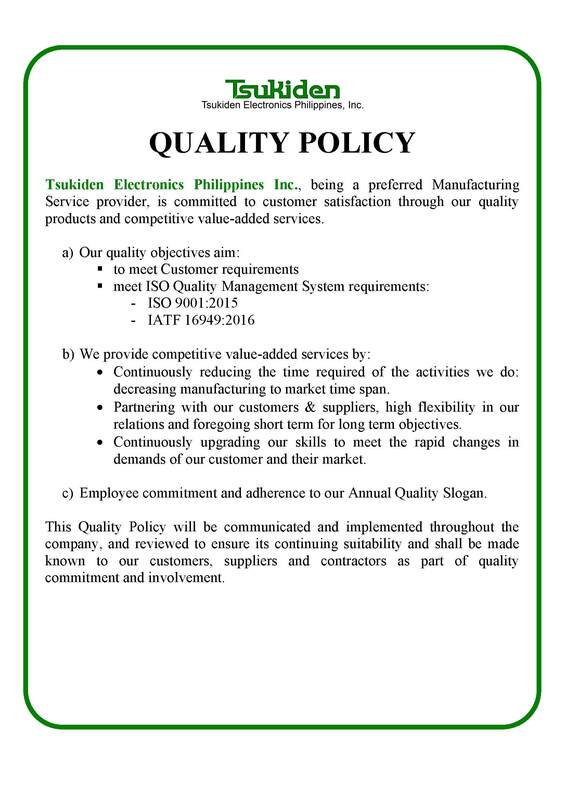 » ABOUT US | Tsukiden Electronics Philippines, Inc.
"Your preferred Electronic Manufacturing Service Provider!" 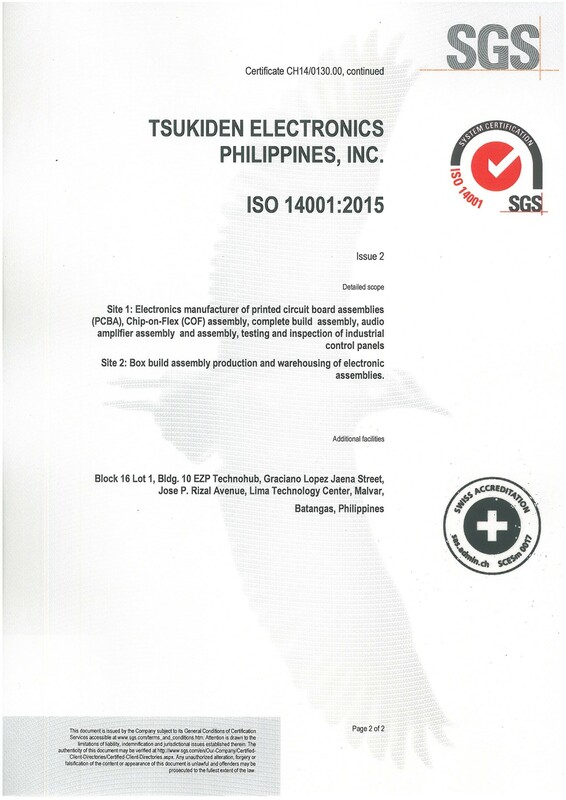 Tsukiden Electronics Philippines, Inc. is an electronic manufacturing service provider in the Philippines, offering surface mount technology up to final product assembly. We cater to different companies worldwide from the field of medical, industrial, telecommunications, automotive and consumer products. With decade of experience in electronics service, we gain trust from our customers through our certified systems compliance to ISO 9001, ISO 14001, OHSAS 18001, ISO/TS 16949 and ISO 13485. For customer’s satisfaction, we offer one stop shop solution through partnering with various Supply Chain providers, including assistance for start-up business ventures. 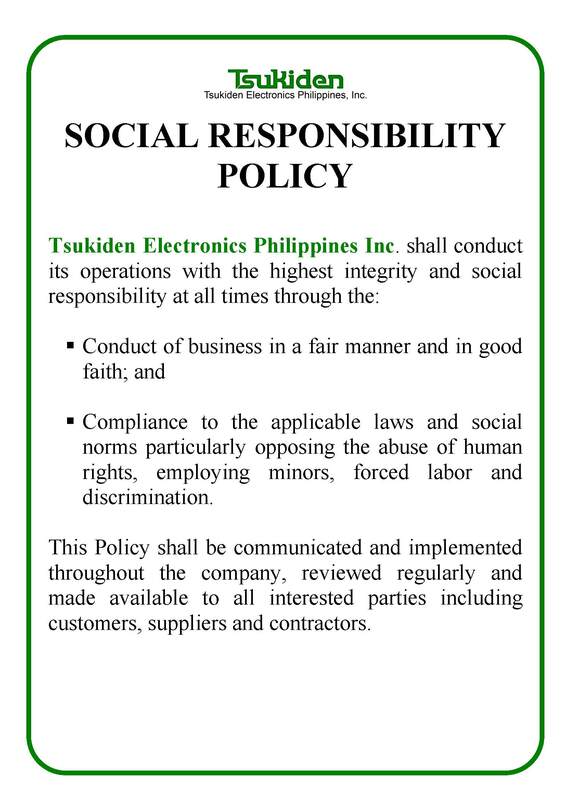 Tsukiden Electronics Philippines, Inc. is a wholly owned subsidiary of Tsukiden Hong Kong Ltd. 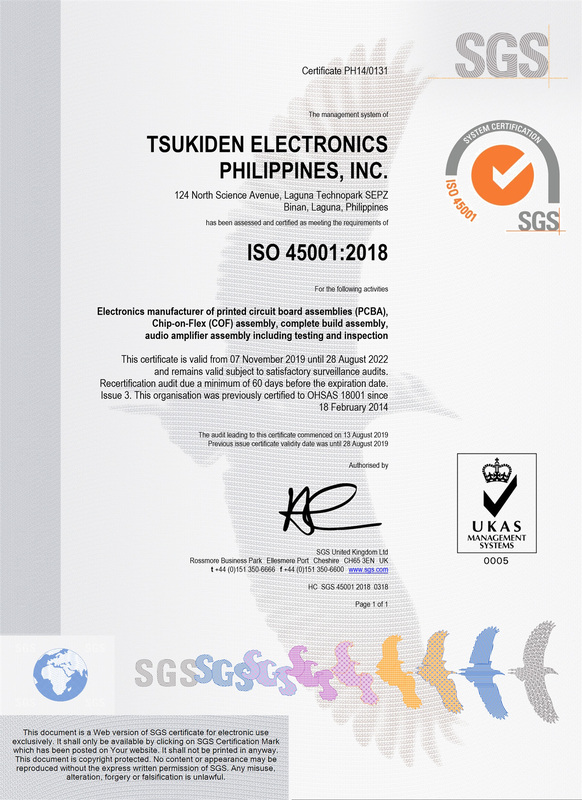 Thank you for your interest in Tsukiden Electronics Philippines, Inc. should you wish to have a detailed information of our company please feel free to contact us. 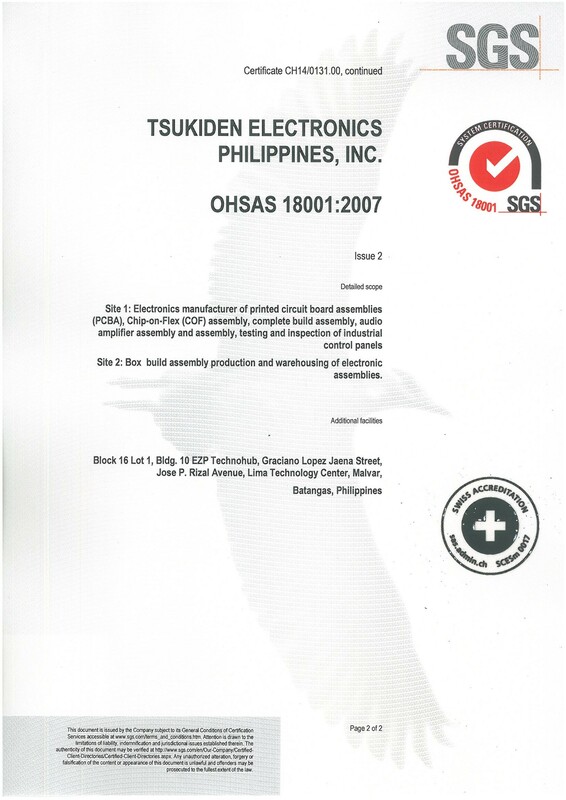 Tsukiden Electronics Philippines Inc. (Tsukiden) started its operation in the Philippines as PCB Assembly Sub Contractor. Tsukiden established a building facility in Cubao, Quezon City for Floppy Disk Drive (FDD) Unit Assembly. Start of 3.5″ Hard Disk Drive (HDD) production in a clean room facility. 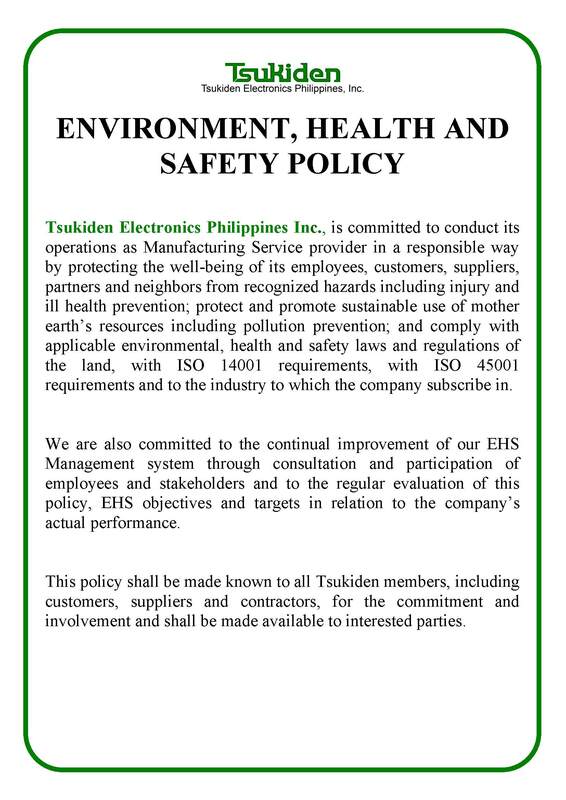 Tsukiden established a plant & transferred its FDD Unit Assembly in Laguna Technopark, Binan Laguna. Start of Analog Mobile Phone production at the Laguna plant. Tsukiden constructed Laguna Plant 2 for the assembly of high capacity 3.5″ Hard Disk Drive (HDD). Start of SMT assembly for Floppy Disk Drive PCB Assembly at Laguna Plant 1. ISO9002 Quality Management System Certificate were acquired for Plant2 under SGS and Plant 1 under TUV. 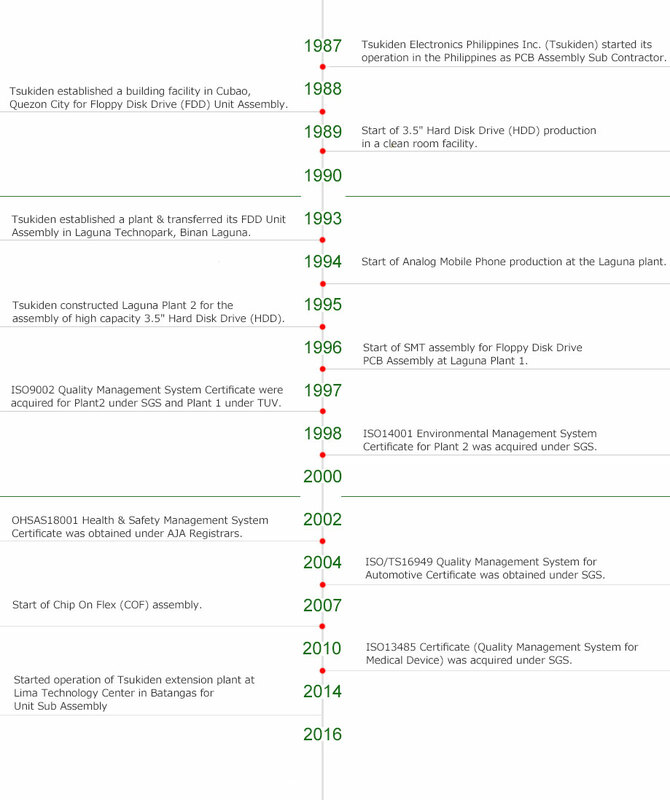 ISO14001 Environmental Management System Certificate for Plant 2 was acquired under SGS. OHSAS18001 Health & Safety Management System Certificate was obtained under AJA Registrars. ISO/TS16949 Quality Management System for Automotive Certificate was obtained under SGS. Start of Chip On Flex (COF) assembly. ISO13485 Certificate (Quality Management System for Medical Device) was acquired under SGS. 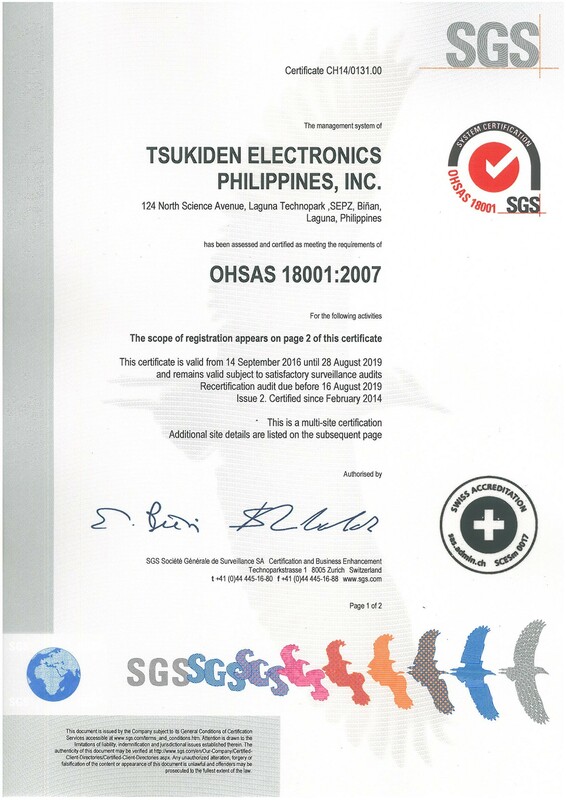 “Tsukiden Electronics Philippines, Inc. has been in the Electronic Manufacturing Service for more than twenty (20) years. Incorporated in March 1992, as a wholly owned subsidiary of Tsukiden Kogyo Co., Ltd. of Japan. In August 1993, Tsukiden started the assembly of Floppy Disk Drive while Hard Disk Drive assembly commenced in September 1995. Due to fast growing market demand of electronics assemblies, we expanded our operation and added Printed Circuit Board (PCB) assembly, Flexible Printed Circuit (FPC) assembly and complete electronic device assembly in our portfolio of business in March 2014. To date, were serving different customers and applications worldwide from the field of medical, industrial, telecommunications, automotive and consumer electronics. Equipped with a mindset for high quality and reliable product/services, we continue to stay true to our vision of “Bridging Customers to their Needs”. With certification systems ISO9001:2008; ISO14001:2004; ISO/TS16949:2009 and OHSAS 18001:2007, and customer focused production set-up, supported by flexible and motivated employees as a perfect recipe to excellent quality and competitive price and with the use of latest surface mount technology (SMT) machines, test equipment’s and processes that can do both “high mix low volume and low mix high volume production, surely our customer will gain only the benefit of this partnership. 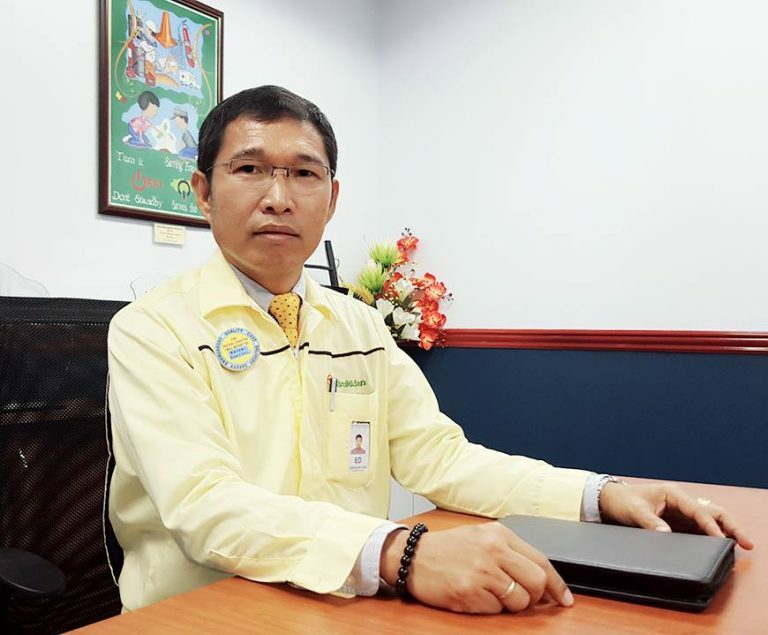 Aiming to be the No.1 EMS provider in the Philippines, we are working under the slogan of “Work Hard, Work Smart and be competitive to exceed customer satisfaction” which manifest our intense desire to be more innovative in every aspects to offer affordable value with high quality products to our customer.